“Antichthon” refers to the ancient Greek idea that there was a “Counter-Earth”, 180 degrees opposite of Earth, but unseeable since it was always on the opposite side of the “Central Fire” from Earth. Today, that notion sounds quaint and ridiculous. But if such a planet did indeed exist, what was it like? Was it a mirror-image world where everything was the opposite of our world? These days we have new notions of the unseeable. There’s the concept of the multiverse, that there is more than one universe, and that “big bangs” are happening all the time, the quantum foam bubbling away, giving birth to new universes. And in these universes from a higher dimension, the laws of physics that we know to be true in our home universe may not be the same. Matter may not be the same. Light may not exist as we know it. Gravity may not exist or it may behave completely differently. In short, Everything would be different. We wanted to create something really different. We wanted to give you a big bang for your creative impulses. Antichthon. Dynamic tone-generation that you can play your guitar through. 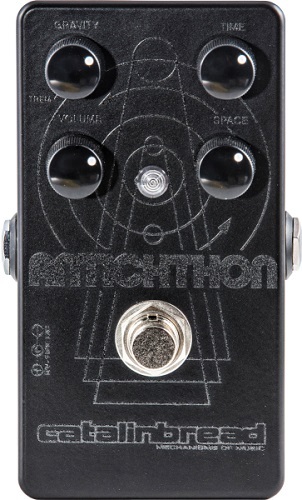 Antichthon can create its own sounds even without you touching a string. But when you do play your guitar you can push and pull against the other-worldly tones Antichthon creates – Tibetan horns from another dimension, galactic dolphins, sub-bass drones that will rattle the foundation, bird calls, dark matter locusts, space cats, and more. You set the controls on Antichthon to create your own new universe. Then you work your guitar’s volume knob to travel through it.